Journal entries and Photos are now available! Tuesday, July 12th, Nimblewill completed Odyssey 2016, the Pony Express National Historic Trail, 1,940 miles, 99 days. This trek was accomplished in segments by hiking new trail and interconnecting previously hiked parts of other trails. All journal entries and photos are now posted. Odyssey 2016, Nimblewill's ongoing trek back in time--another go at the wild-wild west, to be challenged by the most isolated and difficult segment of the Pony Express National Historic Trail. It's called the Central Overland Route, that 500-mile no-man's-land segment of high-plains desert that stretches across Utah and Nevada. 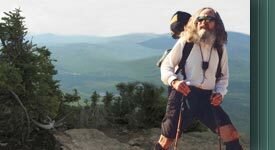 Bart Smith, the first person to trek all 11 National Scenic Trails is once again trekking with Nimblewill. You'll recall that Bart and Nimblewill hiked together last year as they completed their respective hikes o'er the California and Mormon Pioneer National Historic Trails. SO -- Nimblewill and Bart were on the trail again. They began Odyssey 2016 on the 13th of May from Salt Lake City, Utah, bound for Fort Churchill, Nevada. As of Friday, June 10, 1:30 p.m., the Nimblewill and Bart finished the 570-mile Central Overland Trail desert section of the Pony Express, from Salt Lake City, Utah to just west of Fort Churchill, Nevada. This completes this National Historic Trail for Bart. The Nimblewill has yet one small 125-mile section in Kansas (from Troy to Maryville) to hike to complete this National Historic Trail for himself. He will hike that section yet this summer. The Nimblewill and Bart feel very fortunate and thankful to have made the crossing safely. It was an amazing adventure. The new section for Odyssey 2016 PENHT is available for viewing. Just click on "Odyssey 2016 PENHT" in the Site Menu on the left of the page. In 2014, as Nimblewill trekked the Oregon Trail, he picked up the Mormon Trail, where it joins the Great Platte River Road near Fort Kearny, Nebraska. From there, he followed the loosely combined tracks of the Oregon, California, Pony Express--and the Mormon Trail[s] to Fort Bridger, Wyoming. Confusing? Sure! Because, and as circumstance would have it, Nimblewill's journey o'er the Mormon Trail is a puzzle, pieced together as separate segments, from different times. And so, to finish his Mormon Trail Odyssey, on Friday, September 11 he departed Nauvoo, Illinois, from there to close the final gap--to Fort Kearny, Nebraska. Just before noon, Tuesday, October 6, 2015, at the intersection of US-30 and SR-44 in Kearney, Nebraska, he completed the remainder of this trek o'er the Mormon Pioneer National Historic Trail, the eastern segment--26 days, 560 miles. "It proved both rewarding and joy-filled. That so many of you chose to follow along day-to-day, rewarding and humbling. Unbeknownst to you, I received great energy from each of you, real and palpable energy in every respect. Thank you, and thank You, Lord, for the fortitude, the energy, and the resolve to successfully complete another remarkable odyssey!" To view the journals, images, etc., just click on Odyssey 2015 MPNHT in the Site Menu at the left of the page. With the California National Historic Trail completed, the Nimblewill Nomad and Bart headed for Fort Bridger, Wyoming; there to hike the western extent of the Mormon National Historic Trail (that neither had yet hiked). Nimblewill and Bart have completed their Mormon National Historic Trail trek (the western-most segment) from Fort Bridger, Wyoming, to "This is the Place," Salt Lake City, Utah, just before three on Saturday, July 10th. Along the way, they met (and made everlasting friends with) a joy-filled group of Mormon youth, their families supporting, (latter day emigrants--say Saints) pushing/pulling their handcarts across the rugged and rocky old Mormon Trail. The Mormons invited Nimblewill and Bart into their camp that evening, there to partake in supper, then to camp the night. The following day was spent with the youth, as Nimblewill and Bart experienced (and tapped into) their boundless enthusiasm and youthful excitement--on the "trail." A most memorable and rewarding journey for both Nimblewill and Bart. For sure, you'll want to follow along, this odyssey. A Mormon Pioneer National Historic Trail page will be up as soon, with Journals, Photos, and Video. Another year, another odyssey for Nimblewill? Oh yes, with continued encouragement from family, friends, and fellow intrepid--and considering the Lord�s boundless blessings of good health, stamina, and resolve, he�ll keep trekking on. And so for 2015, Odyssey 2015, plans were to continue the journey back through time, by hiking another of the greatest trails in all of American history, the California National Historic Trail. On May 28th, Nimblewill, along with Bart Smith, the first person to trek all eleven National Scenic Trails, set out from Raft River/Parting of the Ways in south central Idaho. From there--bound for Sacramento. The Nimblewill and Bart successfully completed the trek o'er the CNHT, Sutter's Fort, a few minutes past noon on Friday, July 3rd. A difficult and challenging journey. They were blessed to have been granted wide, safe passage, to have finished strong and in good health. The final photos and videos have been posted! A HIKER TRASH section has been added to this site. This is meant to be a fun and thought provoking collection of sayings/truths from the famous, the not so famous, and hiker trash. So sit back, relax, and have some fun reading the Nimblewill's collection of "101 reasons why You Might Be Hiker Trash." To view these sayings at any time, please click on "Hiker Trash" in the lower portion of the Site Menu to your left. A ROADWALKING TUTORIAL has been added to this site! The Nimblewill Nomad has been thinking about adding a roadwalking tutorial for quite some time. Anyone who knows him is aware that he is no stranger to roadwalking, indeed he just completed this year's 1555.5 mile odyssey as entirely a roadwalk, from beginning to end. So, with many a Tarmac mile under his feet, the Nomad is now sharing his thoughts/experience on the subject, and a Safety Rating Table to support/clarify the tutorial. To view the tutorial at any time, please click on "Roadwalk Tutorial" in the lower portion of the Site Menu to your left. This is a second edition (528 page, paperback version) of this book. The first edition (Year 2000, hardback version) sold out very quickly and has only been occasionally available through the secondary market. Planning a hike, or just a day outdoors? Having up to date weather information can help! 7-day forecast by "City, State or Zip Code"
Whether you're visiting the Nomad's site, or perhaps met up with him somewhere along the trail, why not take a moment to sign his guestbook and let him know! For those of you who may have signed a guestbook previous to 2005, unfortunately those files cannot be revived for use on the current site so, please sign again. Although your e-mail address will be required to sign, it will not be publicly displayed on the Internet. To sign, please click on "Sign Guestbook" in the navigation bar on the left side of your screen or the Guestbook icon above.